Endoscopic clips are specialized instruments. These clips are designed to achieve tissue approximation in gastrointestinal endoscopy. These were first introduced for the sole purpose of achieving hemostasis of gastrointestinal bleeding, especially peptic ulcer bleeding. Usage of endoscopic clips has been expanded to a number of applications such as closure of perforations, Dieulafoy’s lesion, varices, bleeding arteries less than 2 mm, and polyps less than 1.5 cm in diameter in the GI tract. However, there are few concerns regarding accuracy, safety, and retention of these devices. The global endoscopic clips market is driven by increase in incidence of bleeding during surgeries. Endoscopic clips are widely used in hemostasis-related problems such as bleeding arteries and ulcers. In developing regions, improved health care infrastructure, rise in demand for endoscopic treatment, supportive government initiatives, and high acceptance of minimal invasive surgeries are factors fueling the growth of the market. However, unfavorable reimbursement policies, and safety and side effects due to usage of endoscopic clips restrain the global market. The global endoscopic clips market has been segmented based on application, end-user, and region. In terms of application, the global market has been classified into endoscopic marking, hemostasis, and others. The hemostasis segment has been divided into mucosal/submucosal defects, bleeding ulcers, bleeding arteries, and polypectomy sites. Based on end-user, the global endoscopic clips market has been classified into hospitals, ambulatory surgical centers, clinics, and others. In terms of region, the global endoscopic clips market has been segmented into North America, Europe, Asia Pacific, Latin America, and Middle East & Africa. The endoscopic marking segment is projected to expand at a high CAGR during the forecast period. The segment is anticipated to account for major share of the market by 2026. Hemostasis plays a vital role in stopping bleeding of ulcers and arteries. Endoscopic clips are also used for endoscopic marking, closure of perforations throughout the GI tract, post-operative anastomotic leakage, fluoroscopic-guided therapy, endoscopic repeat examination, and attachment of feeding tubes. Increase in the number of patients suffering from peptic ulcers, rise in use of endoscopy as an effective tool in diagnosis, prognostication, and therapy for bleeding ulcers drive the hemostasis segment. Additionally, endoscopic clips provide ease of use of delivery systems, reliable deployment, and better mucosal adherence, provide rotatability, better tissue retention, and appropriate opening distance of the arms. These factors fuel the growth of the global endoscopic clips market. Endoscopic clips are largely used as radiopaque markers. Precise marking before any surgical or minimally invasive surgical procedure helps to minimize the risk of recurrent bleeding. North America dominated the global endoscopic clips market in 2017, followed by Europe and Asia Pacific. Increase in demand for high-quality treatment, popularity of endoscopy devices, and technological advancements are the factors driving the market in these regions. Surge in health care expenditure, favorable reimbursement policies, rise in prevalence of GI tract diseases, and increase in the geriatric population are anticipated to propel the market in these regions during the forecast period. Asia Pacific is an emerging market for endoscopic clips. Increase in population, rise in disposable income, and expansion of key players in the region are the factors anticipated to boost the growth of the market in Asia Pacific. The market in Latin America and Middle East & Africa is expected to be driven by increase in cancer incidence, rise in patient population, improving economy, and investments made by governments. Key players operating in the global endoscopic clips market include Cook Endoscopy, Olympus America, Boston Scientific Corporation, CONMED Corporation, Medtronic, and Ovesco Endoscopy AG. This report analyzes the current and future scenario of the global endoscopic clips market for the period 2016–2026. Increase in incidence of cancer, high acceptance of minimally invasive procedures, rise in popularity of endoscopy, and technological advancements are projected to drive of the global endoscopic clips market during the forecast period. The market report comprises an elaborate executive summary, including a snapshot that provides information on various segments of the market. It also provides information and data analysis of the global market with respect to segments based on application, end-user, and region. A detailed qualitative analysis of drivers, restraints, and opportunities of the market has been provided in the overview section. Additionally, the section comprises competitive matrix and profiles of key players along with business overview to project the competitive landscape of the market. The section also provides market attractiveness analysis based on region and market share analysis in terms of key players, thereby presenting a thorough analysis of the overall competitive scenario in the global endoscopic clips market. The global endoscopic clips market has been segmented based on application, end-user, and region. In terms of application, the global market has been classified into endoscopic marking, hemostasis, and others. The hemostasis segment has been divided into mucosal/submucosal defects, bleeding ulcers, bleeding arteries, and polypectomy sites. Based on end-user, the global endoscopic clips market has been categorized into hospitals, ambulatory surgical centers, clinics, and others. Market size and forecast for each of these segments have been provided for the period from 2018 to 2026, along with their respective CAGRs from 2016 to 2026, considering 2017 as the base year. 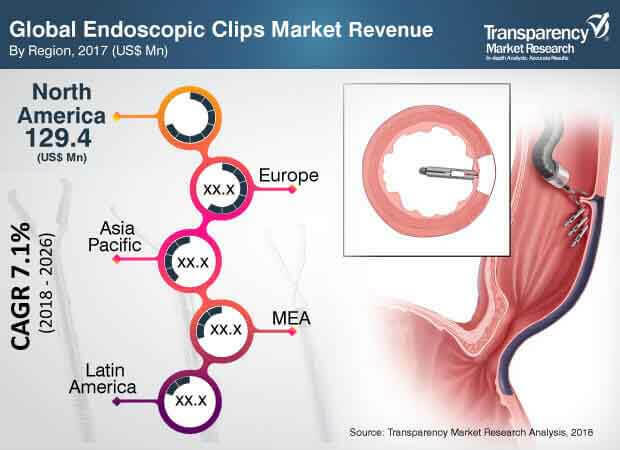 In terms of region, the global endoscopic clips market has been segmented into North America (the U.S. and Canada), Europe (the U.K., Germany, France, Spain, Italy, and Rest of Europe), Asia Pacific (India, China, Japan, Australia & New Zealand, and Rest of Asia Pacific), Latin America (Brazil, Mexico, and Rest of Latin America), and Middle East & Africa (South Africa, GCC Countries, and Rest of Middle East & Africa). Market size and forecast for each of these regions and the mentioned countries/sub-regions have been provided for the period from 2018 to 2026, along with their respective CAGRs from 2016 to 2026, considering 2017 as the base year. The research study also covers the competitive scenario in these regions. The report also profiles major players operating in the global endoscopic clips market based on various attributes such as company overview, financial overview, product portfolio, business strategies, and recent developments. The players covered in the report include Cook Endoscopy, Olympus America, Boston Scientific Corporation, CONMED Corporation, Medtronic, and Ovesco Endoscopy AG.